After volunteering on the construction of the WET system with Tomas Remiarz and Jed at *Earthworm Housing Co-op, designed by Jay at Biologic Design, we dug some trial holes at our field centre to find out how easy it might be to build one. At the moment, the organic nutrients in our wastewater soak away, unseen, into the soil to be converted into tree and grass biomass. But whilst the tree and grass roots get it, some of our visiting students still find it hard to grasp what’s going on underground. 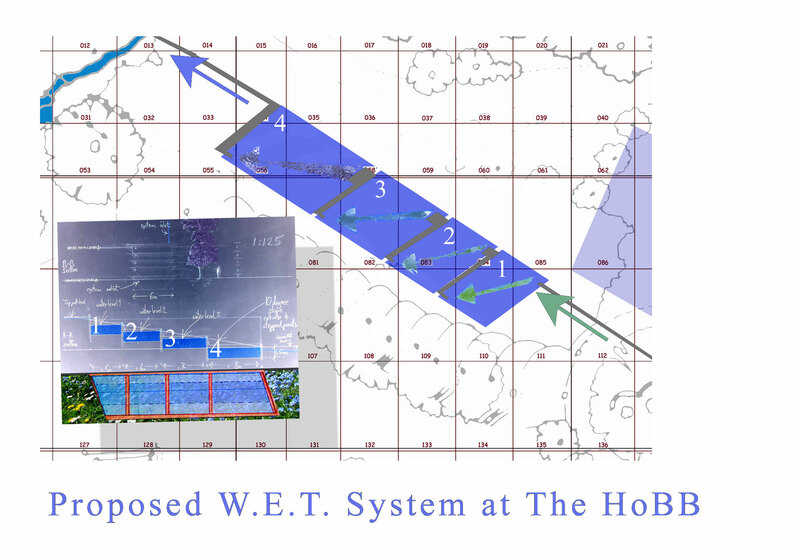 So we have designed a very visible WET System to demonstate our sustainable wastewater purification and also a tree bog. Both should help visitors – and in several ways! WET systems are low-entropy systems as they use no fossil fuels or electricity to purify the wastewater. They are solar powered by the ability of plants to absorb solar energy during photosynthesis. The nutrients found in wastewater are mineralised by micro-organisms in the root-zone, which enables the plants to absorb and use them as an input for growth. As Jay says: “The water on our planet; the most abundant and the most abused, is yet the most accommodating of our natural resources. We take for granted the capacity of water to be renewed and purified, largely by natural means. Water distils itself through the sun powered hydrological cycle in which it passes from rain to river, from river to the ocean, ocean to cloud, cloud to rain and rain back to the river again. Rainfall is filtered as it passes through the soil and subsoil – on its way to wells and springs. It supports a community of animals, plants and micro-organisms which act as a biological purification system. This closely integrated community of living things, together with the physical properties of its environment, constitute an ecosystem. This ecosystem is based upon the photosynthetic abilities of plants to absorb solar energy and the power of the microbial population to absorb chemical nutrients from soil and water redistributing them to many diverse life forms. If you would like to make a comment, either privately or for us to publish and share, then go over to our comments page and make sure you type 091 at the beginning of your comment to grab our attention and show us you’re for real straight away. Thanks.